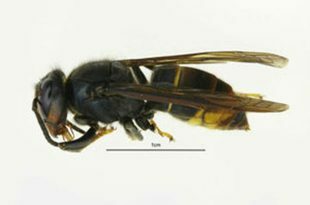 In a recent blog post, Nigel Semmence from the National Bee Unit spoke about the Asian hornet and APHA’s work to prevent the spread of this non-native species and protect bee health. This work, from early detection to eradication, is underpinned with science. Since that post was published, Asian hornet was discovered in the Woolacombe area of Devon in September. Staff from across APHA worked together to rapidly contain the outbreak. The team were visited at the site of the outbreak by George McGavin from BBC’s The One Show who filmed the successful eradication. George was accompanied by Dr Niall Moore, Chief Non-native Species Officer, who explained the importance of early detection of Asian hornet and potential impact if it were to establish. The visit can be viewed here on the BBC iPlayer. The clip begins at 2 minutes 20 seconds, lasting approx. 4 minutes. If you think you have seen an Asian hornet, please notify the GB Non-Native Species Secretariat by emailing alertnonnative@ceh.ac.uk as soon as possible. Alternatively, you can report sightings online. The ‘Asian Hornet Watch’ app is also available to download from the Apple and Android app stores. Beekeepers can find more information about the Asian hornet on the National Bee Unit’s website. more expense for the beekeeper. Vigilance and early reporting of suspected Asian Hornets or nests by beekeepers and members of the public, provides the best opportunity for successful eradication of outbreaks as they occur, avoiding it becoming established. Asian Hornet will predate honey bees and can seriously weaken bee colonies making hives unproductive. We encourage beekeepers to familiarise themselves with this exotic pest, making use of materials on the National Bee Unit's website to maintain a high level of vigilance within their apiaries.